Set in the Charlottenburg district, this is one of Ury’s many Impressionistic Berlin street scenes, which are typically set either at night or in the rain. 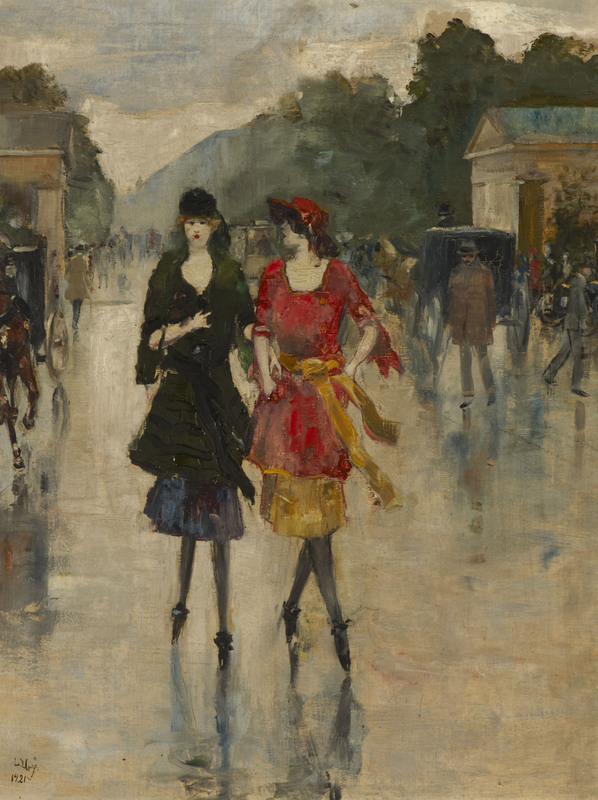 Framed by distinctive classical architecture and accentuated by vivid splashes of colour, the angular shapes of two fashionably dressed young women contrast strongly with the muted background and the horse-drawn carriages which evoke an earlier era. Our focus is cleverly drawn to the two women by the artist’s sparing use of red highlights within a mainly sombre palette – in the dress of one and the dash of lipstick of the other. Lesser Ury died in Berlin in 1931. Shortly afterwards a major memorial exhibition was held at the National Gallery and he is now regarded by critics as perhaps the first German artist to portray life in the modern city. As well as urban landscapes, he also explored Jewish subject matter in his art, although these works were less well received critically both during his lifetime and posthumously. This is one of four works by the artist in the Ben Uri Collection.